Economy secretary Keith Brown said foreign military traffic is a "legitimate" part of Prestwick Airport's business model. Mr Brown inspected the 270 metre long River Dee Crossing as part of the visit. He was also able to provide assurances on the type and level of assistance being provided by Scottish Government. The Cabinet Secretary again today reiterated that Balfour Beatty and Galliford Try have made offers of employment to former Carillion workers on the project where there is a position available. To date, around 90 per cent have transferred over to Balfour Beatty and Galliford Try. He also confirmed that both Balfour Beatty and Galliford Try are committed to fulfilling their obligations to complete the project. 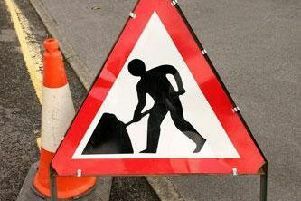 The Cabinet Secretary is continuing to work closely with Aberdeen Roads Limited with a view to opening the project to traffic as soon as practicably possible. In parallel, the impact of Carillion’s withdrawal continues to be assessed and we will seek to mitigate any effects accordingly. Mr Brown said: “It was fantastic to get out on the construction site today and meet the people who are delivering this major infrastructure project which will revolutionise transport in the north east for decades to come. “Since January 15 when Carillion entered compulsory liquidation, my officials and I have had regular discussions with trade unions, the UK Government and other key partners regarding Carillion. I have endeavoured to keep Parliament informed via statements to the chamber, press statements and committee appearances, as well as correspondence. I will continue to do so in the weeks ahead. “It was important to visit the project today and give site representatives some assurances about the next few months, as it has been a worrying time. It is just as important for my officials and Aberdeen Roads Limited to take the time to calculate the implications of this situation and consider what action should be taken to mitigate any knock-on consequences. “However, this is an exciting phase of the project. There is clearly much still to do, and weather will play a part in the final opening date, but it feels like the beginning of the home run towards completion.